Docking@Home is a collaborative project that aims to accomplish both bioscience and computer science goals. From the bioscience point of view, the project aims to further knowledge of the atomic details of protein-ligand interactions and, by doing so, will search for insights into the discovery of novel pharmaceuticals. From the computer science point of view, this project aims to extend volunteer computing to enable adaptive multi-scale modeling of the docking applications: different models that represent the same phenomena in nature with different level of accuracy and resource requirements will be chosen at run-time based on results collected so far and characteristics of the protein-ligand complex. Docking@Home involves collaboration among the University of Delaware, The Scripps Research Institute (TSRI), and the University of California - Berkeley and is powered by BOINC. 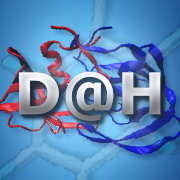 Docking@Home is part of the DAPLDS project (or Dynamically Adaptive Protein-Ligand Docking System project) and is supported by the National Science Foundation (NSF). I'm now part of the BOINC.Italy team, and joined the Rosetta@home project. I partecipated to the 20th World Computer Congress (WCC 2008), the event organized under the advocacy of IFIP (International Federation for Information Processing) that took take place for the first time in Italy, in Milan from 7th to 10th September 2008, at the MIC - Milano Convention Centre. The goal of OSS 2008 was to provide an international forum where a diverse community of professionals from academia, industry and public administration can come together to share research findings and practical experiences. The conference was also meant to provide information and education to practitioners, identify directions for further research, and to be an ongoing platform for technology transfer. The conference consisted of research papers presentations, workshops, tutorials, panels, and project demonstration. Just to open my mind, a good plunge into the fresh water of realistic software and system development in business and research for the next future!